For other uses, see Moncton (disambiguation). 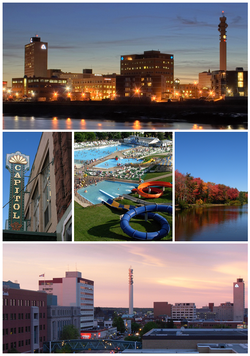 Moncton (/ˈmʌŋktən/; French pronunciation: ​[mɔŋktœn]) is the largest city in the Canadian province of New Brunswick. Situated in the Petitcodiac River Valley, Moncton lies at the geographic centre of the Maritime Provinces. The city has earned the nickname "Hub City" due to its central inland location in the region and its history as a railway and land transportation hub for the Maritimes. The city proper has a population of 71,889 (2016) and has a land area of 142 km2 (55 sq mi). The Moncton CMA has a population of 144,810 (2016), making it the largest city and CMA in New Brunswick, and the second-largest city and CMA in the Maritime Provinces. The CMA includes the neighbouring city of Dieppe and the town of Riverview, as well as adjacent suburban areas in Westmorland and Albert counties. Although the Moncton area was first settled in 1733, Moncton is considered to have been officially founded in 1766 with the arrival of Pennsylvania Dutch immigrants from Philadelphia. Initially an agricultural settlement, Moncton was not incorporated until 1855. The city was named for Lt. Col. Robert Monckton, the British officer who had captured nearby Fort Beauséjour a century earlier. A significant wooden shipbuilding industry had developed in the community by the mid-1840s, allowing for the civic incorporation in 1855, but the shipbuilding economy collapsed in the 1860s, causing the town to lose its civic charter in 1862. Moncton regained its charter in 1875 after the community's economy rebounded, mainly due to a growing railway industry. In 1871, the Intercolonial Railway of Canada had chosen Moncton to be its headquarters, and Moncton remained a railway town for well over a century until the closure of the Canadian National Railway (CNR) locomotive shops in the late 1980s. Although the economy of Moncton was traumatized twice—by the collapse of the shipbuilding industry in the 1860s and by the closure of the CNR locomotive shops in the 1980s—the city was able to rebound strongly on both occasions. The city adopted the motto Resurgo after its rebirth as a railway town. The city's economy is stable and diversified, primarily based on its traditional transportation, distribution, retailing, and commercial heritage, and supplemented by strength in the educational, health care, financial, information technology, and insurance sectors. The strength of Moncton's economy has received national recognition and the local unemployment rate is consistently less than the national average. Acadians settled the head of the Bay of Fundy in the 1670s. The first reference to the "Petcoucoyer River" was on the De Meulles map of 1686. Settlement of the Petitcodiac and Memramcook river valleys began about 1700, gradually extending inland and reaching the site of present-day Moncton in 1733. The first Acadian settlers in the Moncton area established a marshland farming community and chose to name their settlement Le Coude (The Elbow), an allusion to the 90° bend in the river near the site of the settlement. Fort Beasejour in 1755. The Acadian fort was captured by British forces under the command of Robert Monckton. In 1755, nearby Fort Beausejour was captured by British forces under the command of Lt. Col. Robert Monckton. The Beaubassin region including the Memramcook and Petitcodiac river valleys subsequently fell under English control. Later that year, Governor Charles Lawrence issued a decree ordering the expulsion of the Acadian population from Nova Scotia (including recently captured areas of Acadia such as le Coude). This action came to be known as the "Great Upheaval". The reaches of the upper Petitcodiac River valley then came under the control of the Philadelphia Land Company (one of the principals of which was Benjamin Franklin) and in 1766 Pennsylvania Dutch settlers arrived to re-establish the pre-existing farming community at Le Coude. The Settlers consisted of eight families; Heinrick Stief (Steeves), Jacob Treitz (Trites), Matthias Sommer (Somers), Jacob Reicker (Ricker), Charles Jones (Schantz), George Wortmann (Wortman), Michael Lutz (Lutes), and George Koppel (Copple). There is a plaque dedicated in their honor at the mouth of Hall's Creek. They renamed the settlement "The Bend". The Bend remained an agricultural settlement for nearly 80 more years. Even by 1836, there were only 20 households in the community. At this time, the Westmorland Road became open to year-round travel and a regular mail coach service was established between Saint John and Halifax. The Bend became an important transfer and rest station along the route. Over the next decade, lumbering and then shipbuilding would become important industries in the area. The turning point for the community was when Joseph Salter took over (and expanded) a shipyard at the Bend in 1847. The expanded shipyard ultimately grew to employ about 400 workers. The Bend subsequently developed a service-based economy to support the shipyard and gradually began to acquire all the amenities of a growing town. The prosperity engendered by the wooden shipbuilding industry allowed The Bend to incorporate as the town of Moncton in 1855. The town was named for Lt. Col. Robert Monckton, but a clerical error at the time the town was incorporated resulted in the misspelling of the community's name, which has been perpetuated to the present day. The first mayor of Moncton was the shipbuilder Joseph Salter. Two years later, in 1857, the European and North American Railway opened its line from Moncton to nearby Shediac; this was followed by a line from Moncton to Saint John opening in 1859. At about the time of the arrival of the railway, the popularity of steam-powered ships forced an end to the era of wooden shipbuilding. The Salter shipyard closed in 1858. The resulting industrial collapse caused Moncton to surrender its civic charter in 1862. The Intercolonial Railway of Canada depot in Moncton in 1904. The city's economy was revitalized when it was selected as the railway's headquarters in 1871. Moncton's economic depression did not last long and a second era of prosperity came to the area in 1871 when Moncton was selected to be the headquarters of the Intercolonial Railway of Canada (ICR). The arrival of the ICR in Moncton was a seminal event for the community. For the next 120 years, the history of the city would be firmly linked with that of the railway. In 1875, Moncton was able to reincorporate as a town and adopted the motto "Resurgo" (Latin for I rise again). One year later, the ICR line to Quebec was opened. The railway boom that emanated from this and the associated employment growth allowed Moncton to achieve city status on 23 April 1890. Moncton grew rapidly during the early 20th century, particularly after provincial lobbying helped the city become the eastern terminus of the massive National Transcontinental Railway project in 1912. In 1918, the ICR and National Transcontinental Railway (NTR) were merged by the federal government into the newly formed Canadian National Railways (CNR) system. The ICR shops would become CNR's major locomotive repair facility for the Maritimes and Moncton became the headquarters for CNR's Maritime division. The T. Eaton Company's catalogue warehouse moved to the city in the early 1920s, employing over 700 people. Transportation and distribution became increasingly important to the Moncton economy throughout the middle part of the 20th century. The Moncton Airport opened in 1929 and quickly became an important fixture in the community. During the Second World War the Canadian Army built a large military supply base in the city to service the Maritime military establishment. The CNR continued to dominate the economy of the city with railway employment in Moncton peaked at nearly six thousand workers in the 1950s before beginning a slow decline. The Eaton's catalogue warehouse in 1927. The company built the warehouse as Moncton was a centre for railways and shipping. Moncton was placed on the Trans-Canada Highway network in the early 1960s after Route 2 was built along the northern perimeter of the city. Later, the Route 15 was built between the city and Shediac. At the same time, the Petitcodiac River Causeway was constructed. The Université de Moncton was founded in 1963. This institution became an important resource in the development of Acadian culture in the area. The late 1970s and the 1980s were a period of economic hardship for the city as several major employers closed or restructured. The Eatons catalogue division, CNR's locomotive shops facility and CFB Moncton were closed during this time throwing thousands of citizens out of work. The city diversified in the early 1990s with the rise of information technology, led by call centres which made use of the city's bilingual workforce. By the late 1990s, retail, manufacturing and service expansion began to occur in all sectors and within a decade of the closure of the CNR locomotive shops Moncton had more than made up for its employment losses. This dramatic turnaround in the fortunes of the city has been termed the "Moncton Miracle". The growth of the community has continued unabated since the 1990s and has actually been accelerating. The confidence of the community has been bolstered by its ability to host major events such as the Francophonie Summit in 1999, a Rolling Stones concert in 2005, the Memorial Cup in 2006 and both the IAAF World Junior Championships in Athletics and a neutral site regular season CFL football game in 2010. Positive developments include the Atlantic Baptist University (later renamed Crandall University) achieving full university status and relocating to a new campus in 1996, the Greater Moncton Airport opening a new terminal building and becoming a designated international airport in 2002, and the opening of the new Gunningsville Bridge to Riverview in 2005. In 2002, Moncton became Canada's first officially bilingual city. In the 2006 census, Moncton was designated a Census Metropolitan Area and became the largest metropolitan area in the province of New Brunswick. Moncton is located along the north bank of the Petitcodiac River, at a point where the river bends acutely from a west-east to north-south flow. Moncton lies in southeastern New Brunswick, at the geographic centre of the Maritime Provinces. 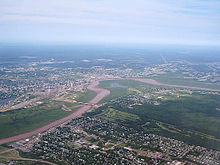 The city is located along the north bank of the Petitcodiac River at a point where the river bends acutely from a west−east to north−south flow. This geographical feature has contributed significantly to historical names given to the community. Petitcodiac in the Mi'kmaq language has been translated as meaning "bends like a bow". The early Acadian settlers in the region named their community Le Coude which means "the elbow". Subsequent English immigrants changed the name of the settlement to The Bend of the Petitcodiac (or simply The Bend). The Petitcodiac river valley at Moncton is broad and relatively flat, bounded by a long ridge to the north (Lutes Mountain) and by the rugged Caledonia Highlands to the south. Moncton lies at the original head of navigation on the river, however a causeway to Riverview (constructed in 1968) resulted in extensive sedimentation of the river channel downstream and rendered the Moncton area of the waterway unnavigable. On 14 April 2010, the causeway gates were opened in an effort to restore the silt-laden river. The Petitcodiac River exhibits one of North America's few tidal bores: a regularly occurring wave that travels up the river on the leading edge of the incoming tide. The bore is as a result of the extreme tides of the Bay of Fundy. Originally, the bore was very impressive, sometimes between 1 and 2 metres (3 ft 3 in and 6 ft 7 in) in height and extending across the 1 kilometre (0.62 mi) width of the Petitcodiac River in the Moncton area. This wave would occur twice a day at high tide, travelling at an average speed of 13 km/h (8.1 mph) and producing an audible roar. Unsurprisingly, the "bore" became a very popular early tourist attraction for the city, but when the Petitcodiac causeway was built in the 1960s, the river channel quickly silted in and reduced the bore so that it rarely exceeds 15 to 20 centimetres (5.9 to 7.9 in) in height. On 14 April 2010, the causeway gates were opened in an effort to restore the silt-laden river. A recent tidal bore since the opening of the causeway gates measured a 2-foot-high (0.61 m) wave, unseen for many years. Despite being less than 50 km (31 mi) from the Bay of Fundy and less than 30 km (19 mi) from the Northumberland Strait, the climate tends to be more continental than maritime during the summer and winter seasons, with maritime influences somewhat tempering the transitional seasons of spring and autumn. Moncton has a warm summer continental climate (Köppen climate classification Dfb) with uniform precipitation distribution. Winter days are typically cold but generally sunny with solar radiation generating some warmth. Daytime high temperatures usually range a few degrees below the freezing point. Major snowfalls can result from nor'easter ocean storms moving up the east coast of North America. These major snowfalls typically average 20–30 cm (8–12 in) and are frequently mixed with rain or freezing rain. Spring is frequently delayed because the sea ice that forms in the nearby Gulf of St. Lawrence during the previous winter requires time to melt, and this will cool onshore winds, which can extend inland as far as Moncton. The ice burden in the gulf has diminished considerably over the course of the last decade (which may be a consequence of global warming), and the springtime cooling effect has weakened as a result. Daytime temperatures above freezing are typical by late February. Trees are usually in full leaf by late May. Summers are warm and humid due to the seasonal prevailing westerly winds strengthening the continental tendencies of the local climate. Daytime highs sometimes reach more than 30 °C (86 °F). Rainfall is generally modest, especially in late July and August, and periods of drought are not uncommon. Autumn daytime temperatures remain mild until late October. First snowfalls usually do not occur until late November and consistent snow cover on the ground does not happen until late December. The Fundy coast of New Brunswick occasionally experiences the effects of post-tropical storms. The stormiest weather of the year, with the greatest precipitation and the strongest winds, usually occurs during the fall/winter transition (November to mid-January). The highest temperature ever recorded in Moncton was 37.8 °C (100 °F) on August 18 & 19, 1935. The coldest temperature ever recorded was −37.8 °C (−36 °F) on February 5, 1948. Skyline of Downtown Moncton, with the Bell Aliant Tower to the right. The Tower is the tallest free-standing structure in Atlantic Canada. Moncton generally remains a "low rise" city. The city's skyline however encompasses many buildings and structures with varying architectural styles from many periods. The most dominant structure in the city is the Bell Aliant Tower, a 127 metres (417 ft) microwave communications tower built in 1971. When it was constructed, it was the tallest microwave communications tower of its kind in North America. It remains the tallest structure in Moncton, dwarfing the neighbouring Place L’Assomption by 46 metres (151 ft). Indeed, the Bell Aliant Tower is also the tallest free-standing structure in all four Atlantic provinces. Assumption Place is a 20-story office building and is the headquarters of Assumption Mutual Life Insurance. This building is 81 metres (266 ft) in height and is tied with Brunswick Square (Saint John) as the tallest building in the province. The Blue Cross Centre is a large nine-story building in Downtown Moncton. Although only nine stories tall, the building is architecturally distinctive, encompasses a full city block, and is the largest office building in the city in terms of square footage. It is the home of Medavie Blue Cross and the Moncton Public Library. There are about a half dozen other buildings in Moncton that range between eight and twelve stories in height, including the Delta Beausejour and Brunswick Crowne Plaza Hotels and the Terminal Plaza office complex. Centennial Park is one of several public parks managed by the city. The most popular park in the area is Centennial Park, which contains an artificial beach, lighted cross country skiing and hiking trails, the city's largest playground, lawn bowling and tennis facilities, a boating pond, a treetop adventure course, and Rocky Stone Field, a city owned 2,500 seat football stadium with artificial turf, and home to the Moncton Minor Football Association. The city's other main parks are Mapleton Park in the city's north end, Irishtown Nature Park (one of the largest urban nature parks in Canada) and St. Anselme Park (located in Dieppe). The numerous neighbourhood parks throughout the metro Moncton area include Bore View Park (which overlooks the Petitcodiac River), and the downtown Victoria Park, which features a bandshell, flower gardens, fountain, and the city's cenotaph. There is an extensive system of hiking and biking trails in Metro Moncton. The Riverfront Trail is part of the Trans Canada Trail system, and various monuments and pavilions can be found along its length. The population of Moncton is 71,889 (2016 Census). Along with Fredericton and Halifax, Moncton is one of only three Maritime cities to register a population increase in recent years. A sign at the entrance of Moncton. Both English and French is used on the sign, the two most spoken languages in the city. Moncton is a bilingual city. About two-thirds of its residents are native English speakers, while the remaining third is French-speaking. Almost all Monctonians speak English (64.6%) or French (31.9%) as first languages; 1.6% speak both languages as a first language, and 6.9% speak another language. About 46% of the city population is bilingual and understands both English and French; the only other Canadian cities that approach this level of linguistic duality are Ottawa, Sudbury, and Montreal. Moncton became the first officially bilingual city in the country in 2002. The adjacent city of Dieppe is about 73% Francophone and has benefited from an ongoing rural depopulation of the Acadian Peninsula and areas in northern and eastern New Brunswick. The town of Riverview meanwhile is heavily (95%) Anglophone. The census metropolitan area (CMA) grew by 4% between 2011 and 2016. 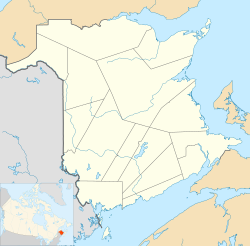 The census metropolitan area had a population of 144,810 as of the 2016 national census, which makes it the largest metropolitan area in the province of New Brunswick and the second largest in the Maritime Provinces after Halifax. The CMA includes the city of Dieppe (population 25,384), town of Riverview (19,667), Moncton Parish (9,811), Memramcook (4,778), Coverdale Parish (4,466), and Salisbury (2,284). Migration is mostly from other areas of New Brunswick (especially the north), Nova Scotia (13%), and Ontario (9%). 62% of new arrivals to the city are Anglophone and 38% are Francophone. There are 2,990 Aboriginal people living in Moncton, who make up 4.3% of the city's population. There are 3,305 visible minorities in Moncton. Black peoples and South Asians are the largest visible minority groups, comprising 1.7% and 0.7% of the city's population, respectively. There is also a growing Korean community in Moncton. The underpinnings of the local economy are based on Moncton's heritage as a commercial, distribution, transportation, and retailing centre. This is due to Moncton's central location in the Maritimes: it has the largest catchment area in Atlantic Canada with 1.6 million people living within a three-hour drive of the city. The insurance, information technology, educational, and health care sectors also are major factors in the local economy with the city's two hospitals alone employing over five thousand people. The Blue Cross Centre is the headquarters for Medavie Blue Cross. A number of headquarters are located in Moncton. Moncton has garnered national attention because of the strength of its economy. The local unemployment rate averages around 6%, which is below the national average. In 2004 Canadian Business Magazine named it "The best city for business in Canada", and in 2007 FDi magazine named it the fifth most business friendly small-sized city in North America. A number of nationally or regionally prominent corporations have their head offices in Moncton including Atlantic Lottery Corporation, Assumption Life Insurance, Medavie Blue Cross Insurance, Armour Transportation Systems and Major Drilling Group International. Moncton also has federal public service employment, with regional head offices for Corrections Canada, Transport Canada, the Gulf Fisheries Centre and the Atlantic Canada Opportunities Agency. There are 37 call centres in the city which employ over 5000 people. Some of the larger centres include Asurion, Numeris (formerly BBM Canada), Exxon Mobil, Royal Bank of Canada, Tangerine Bank (formerly ING Direct), UPS, Fairmont Hotels and Resorts, Rogers Communications, and Sitel. A growing high tech sector includes companies such as Gtech, Nanoptix, International Game Technology, OAO Technology Solutions, BMM Test Labs, TrustMe, and BelTek Systems Design. TD Bank announced in 2018 a new banking services centre to be located in Moncton which will employ over 1,000 people (including a previously announced customer contact centre). Several arms of the Irving corporation have their head offices and/or major operations in greater Moncton. These include Midland Transport, Majesta/Royale Tissues, Irving Personal Care, Master Packaging, Brunswick News, and Cavendish Farms. Kent Building Supplies (an Irving subsidiary) opened their main distribution centre in the Caledonia Industrial Park in 2014. The Irving group of companies employs several thousand people in the Moncton region. There are three large industrial parks in the metropolitan area. The Irving operations are concentrated in the Dieppe Industrial Park. The Moncton Industrial Park in the city's west end has been expanded. Molson/Coors opened a brewery in the Caledonia Industrial Park in 2007, its first new brewery in over fifty years. All three industrial parks also have large concentrations of warehousing and regional trucking facilities. Downtown Moncton acts as the central business district for the city. It houses a number of government and financial offices. A new four-lane Gunningsville Bridge was opened in 2005, connecting downtown Riverview directly with downtown Moncton. On the Moncton side, the bridge connects with an extension of Vaughan Harvey Boulevard as well as to Assumption Boulevard and will serve as a catalyst for economic growth in the downtown area. This has become already evident as an expansion to the Blue Cross Centre was completed in 2006 and a Marriott Residence Inn opened in 2008. The new regional law courts on Assumption Blvd opened in 2011. A new 8,800 seat downtown arena (the Avenir Centre) recently opened in September 2018. On the Riverview side, the Gunningsville Bridge now connects to a new ring road around the town and is expected to serve as a catalyst for development in east Riverview. The retail sector in Moncton has become one of the most important pillars of the local economy. Major retail projects such as Champlain Place in Dieppe and the Wheeler Park Power Centre on Trinity Drive have become major destinations for locals and for tourists alike. Tourism is an important industry in Moncton and historically owes its origins to the presence of two natural attractions, the tidal bore of the Petitcodiac River (see above) and the optical illusion of Magnetic Hill. The tidal bore was the first phenomenon to become an attraction but the construction of the Petitcodiac causeway in the 1960s effectively extirpated the attraction. Magnetic Hill, on the city's northwest outskirts, is the city's most famous attraction. The Magnetic Hill area includes (in addition to the phenomenon itself), a golf course, major water park, zoo, and an outdoor concert facility. A $90 million casino/hotel/entertainment complex opened at Magnetic Hill in 2010. Moncton's Capitol Theatre is a performing arts venue and hosts productions for the Atlantic Ballet Theatre of Canada, and Theatre New Brunswick. Moncton's Capitol Theatre, an 800-seat restored 1920s-era vaudeville house on Main Street, is the main centre for cultural entertainment for the city. The theatre hosts a performing arts series and provides a venue for various theatrical performances as well as Symphony New Brunswick and the Atlantic Ballet Theatre of Canada. The adjacent Empress Theatre offers space for smaller performances and recitals. The Molson Canadian Centre at Casino New Brunswick provides a 2,000 seat venue for major touring artists and performing groups. The Moncton-based Atlantic Ballet Theatre tours mainly in Atlantic Canada but also tours nationally and internationally on occasion. Théâtre l'Escaouette is a Francophone live theatre company which has its own auditorium and performance space on Botsford Street. The Anglophone Live Bait Theatre is based in the nearby university town of Sackville. There are several private dance and music academies in the metropolitan area, including the Capitol Theatre's own performing arts school. Aberdeen Cultural Centre is an Acadian cultural cooperative containing multiple studios and galleries. The Aberdeen Cultural Centre is a major Acadian cultural cooperative containing multiple studios and galleries. Among other tenants, the Centre houses the Galerie Sans Nom, the principal private art gallery in the city. The city's two main museums are the Moncton Museum at Resurgo Place on Mountain Road and the Musée acadien at Université de Moncton. The Moncton Museum reopened following major renovations and an expansion to include the Transportation Discovery Centre. The Discovery Centre includes many hands on exhibits highlighting the city's transportation heritage. The city also has several recognized historical sites. The Free Meeting House was built in 1821 and is a New England-style meeting house located adjacent to the Moncton Museum. The Thomas Williams House, a former home of a city industrialist built in 1883, is now maintained in period style and serves as a genealogical research centre and is also home to several multicultural organizations. The Treitz Haus is located on the riverfront adjacent to Bore View Park and has been dated to 1769 both by architectural style and by dendrochronology. It is the only surviving building from the Pennsylvania Dutch era and is the oldest surviving building in the province of New Brunswick. In film production, the city has since 1974 been home to the National Film Board of Canada's French-language Studio Acadie. Moncton is home to the Frye Festival, an annual bilingual literary celebration held in honour of world-renowned literary critic and favourite son Northrop Frye. This event attracts noted writers and poets from around the world and takes place in the month of April. The Atlantic Nationals Automotive Extravaganza, held each July, is the largest annual gathering of classic cars in Canada. Other notable events include The Atlantic Seafood Festival in August, The HubCap Comedy Festival, and the World Wine Festival, both held in the spring. Located in northwestern Moncton, Magnetic Hill is an attraction famous for its gravity hill optical illusion. Magnetic Hill is on the northwestern outskirts of Moncton and is now the city's most famous attraction. It is a gravity hill optical illusion, where the local topography gives the impression that you are going uphill when in fact you are going downhill. The "Magnetic Hill Illusion" is a popular tourism draw and both the city and province have built major tourism developments on the surrounding properties to capitalize on this. The complex includes The Magnetic Hill Zoo, a nationally accredited and award-winning zoo with over 400 animals displayed in themed exhibit areas. It is the largest zoo in Atlantic Canada, has well-developed and popular educational program, and was ranked as the fourth best zoo in Canada in 2007. Also on site is Magic Mountain, the largest water park in Atlantic Canada, with a half dozen large water slides, a lazy river, wave pool, children's splash pool, and a 36-hole mini-golf course. An adjacent amusement park is now under construction and will be completed in 2017. The Magnetic Hill Concert Site, a large outdoor concert facility which holds one or two large concerts every year is located nearby. The Rolling Stones performed there in 2005 in front of 85,000 fans. The Eagles played there in the summer of 2008 in front of 55,000 fans. AC/DC and Bon Jovi played at the hill in 2009, with the crowd for the AC/DC concert exceeding 70,000. The Magnetic Hill Concert Site has developed a reputation for holding the largest concert productions in the entire country. U2 played the final concert of their worldwide U2 360° Tour at Magnetic Hill on 30 July 2011. The Casino New Brunswick, which also encompasses a hotel and 2,000 seat entertainment venue also opened at Magnetic Hill in 2010. The performance space at the Casino New Brunswick has already hosted many top acts on the casino circuit. At present, the major destinations for shopping enthusiasts in Greater Moncton are the Northwest Centre, and the Wheeler Park Power Centre in Moncton, and Champlain Place in Dieppe, which, at 816,000 square feet (75,800 m2), is the largest shopping mall in Atlantic Canada and has over 160 stores and services. The Bass Pro Complex is adjacent to Champlain Place and is co-managed by Cadillac Fairview. It includes a Chapters bookstore, multiplex cinema complex and includes a Bass Pro Shop. The Moncton Sports Dome is an indoor air-supported building used for a number of different sports and recreational activities. The Avenir Centre is an 8,800 seat arena which serves as a venue for major concerts and sporting events and is the home of the Moncton Wildcats of the Quebec Major Junior Hockey League and the Moncton Magic of the National Basketball League of Canada. The CN Sportplex is a major recreational facility which has been built on the former CN Shops property. It includes ten ballfields, six soccer fields, an indoor rink complex with four ice surfaces (the Superior Propane Centre) and the Hollis Wealth Sports Dome, an indoor air supported multi-use building. The Sports Dome is large enough to allow for year-round football, soccer and golf activities. A newly constructed YMCA near the CN Sportsplex has extensive cardio and weight training facilities, as well as three indoor pools. The CEPS at Université de Moncton contains an indoor track and a 37.5 metres (123 ft) swimming pool with diving towers. The new Moncton Stadium, also located at the U de M campus was built for the 2010 IAAF World Junior Track & Field Championships. It has a permanent seating for 10,000, but is expandable to a capacity of over 20,000 for events such as professional Canadian football. The only velodrome in Atlantic Canada is in Dieppe. The metro area has a total of 12 indoor hockey rinks and three curling clubs. Other public sporting and recreational facilities are scattered throughout the metropolitan area, including a new $18 million aquatic centre in Dieppe opened in 2009. Greater Moncton has many golfing facilities. There are nine 18-hole golf courses in the census metropolitan area, four of which are residential courses with courseside housing developments either existing or under construction. Both the Royal Oaks and Fox Creek golf clubs can be considered championship courses, with Royal Oaks being the first Rees Jones designed golf course in Canada. Other notable courses include the Moncton Golf & Country Club, Hillsborough Golf Club, Memramcook Valley Golf Club and the Mountain Woods Golf Club. The Moncton Wildcats play major junior hockey in the Quebec Major Junior Hockey League (QMJHL). They won the President's Cup, the QMJHL championship in both 2006 and 2010. Historically there has been a longstanding presence of a Moncton-based team in the Maritime Junior A Hockey League, but the Dieppe Commandos (formerly known as the Moncton Beavers) relocated to Edmundston at the end of the 2017 season. Historically, Moncton also was home to a professional American Hockey League franchise from 1978 to 1994. The New Brunswick Hawks won the AHL Calder Cup by defeating the Binghamton Whalers in 1981-1982. The Moncton Mets played baseball in the New Brunswick Senior Baseball League and won the Canadian Senior Baseball Championship in 2006. In 2015, the Moncton Fisher Cats began play in the New Brunswick Senior Baseball League. They were formed by a merger between the Moncton Mets and the Hub City Brewers of the NBSBL. In 2011, the Moncton Miracles began play as one of the seven charter franchises of the professional National Basketball League of Canada. The franchise failed at the end of the 2016/17 season, to be immediately replaced by a new NBL franchise, the Moncton Magic, who played their inaugural season in 2017/18. The Universite de Moncton has a number of active CIS university sports programs including hockey, soccer, and volleyball. These teams are a part of the Canadian Interuniversity Sport program. Moncton Stadium is a multi-purpose stadium that has hosted a number of events, including several games in the 2015 FIFA Women's World Cup. Moncton has hosted many large sporting events. The 2006 Memorial Cup was held in Moncton with the hometown Moncton Wildcats losing in the championship final to rival Quebec Remparts. Moncton hosted the Canadian Interuniversity Sports (CIS) Men's University Hockey Championship in 2007 and 2008. The World Men's Curling Championship was held in Moncton in 2009; the second time this event has taken place in the city. Moncton also hosted the 2010 IAAF World Junior Championships in Athletics. This was the largest sporting event ever held in Atlantic Canada, with athletes from over 170 countries in attendance. The new 10,000 seat capacity Moncton Stadium was built for this event on the Université de Moncton campus. The construction of this new stadium led directly to Moncton being awarded a regular season neutral site CFL game between the Toronto Argonauts and the Edmonton Eskimos, which was held on 26 September 2010. This was the first neutral site regular season game in the history of the Canadian Football League and was played before a capacity crowd of 20,750. Additional CFL regular season games were held in 2011 and 2013. Moncton was one of only six Canadian cities chosen to host the 2015 FIFA Women's World Cup. Moncton City Hall is the seat of municipal government. The municipal government consists of a mayor and ten city councillors elected to four-year terms of office. The council is non-partisan with the mayor serving as the chairman, casting a ballot only in cases of a tie vote. There are four wards electing two councillors each with an additional two councillors selected at large by the general electorate. Day-to-day operation of the city is under the control of a City Manager. The greater Moncton area contains nine of New Brunswick's 49 provincial electoral districts: Moncton Centre, Moncton East, Moncton South, Moncton Southwest, Moncton Northwest, Dieppe, Shediac Bay-Dieppe, Riverview and Albert. Of the nine members of the Legislative Assembly that represent greater Moncton, five belong to the Liberal party and four belong to the Progressive Conservative party. Moncton is in the federal riding of Moncton—Riverview—Dieppe. Portions of Dieppe are in the federal riding of Beauséjour, and portions of Riverview are in the riding of Fundy Royal. In the current federal parliament, all three members from the metropolitan area belong to the Liberal party. The current federal MP for Moncton—Riverview—Dieppe is Ginette Petitpas Taylor (Liberal), as of the 2015 federal election. The southwestern portion of the former CFB Moncton base continues to be used by the Canadian Forces, known as Moncton Garrisson. Aside from locally formed militia units, the military did not have a significant presence in the Moncton area until the beginning of the Second World War. In 1940, a large military supply base (later known as CFB Moncton) was constructed on a railway spur line north of downtown next to the CNR shops. This base served as the main supply depot for the large wartime military establishment in the Maritimes. In addition, two Commonwealth Air Training Plan bases were also built in the Moncton area during the war: No. 8 Service Flying Training School, RCAF, and No. 31 Personnel Depot, RAF. The RCAF also operated No. 5 Supply Depot in Moncton. A naval listening station was also constructed in Coverdale (Riverview) in 1941 to help in coordinating radar activities in the North Atlantic. Military flight training in the Moncton area terminated at the end of World War II and the naval listening station closed in 1971. CFB Moncton remained open to supply the maritime military establishment until just after the end of the Cold War. With the closure of CFB Moncton in the early 1990s, the military presence in Moncton has been significantly reduced. The northern portion of the former base property has been turned over to the Canada Lands Corporation and is slowly being redeveloped. The southern part of the former base remains an active DND property and is now termed the Moncton Garrison. It is affiliated with CFB Gagetown. Resident components of the garrison include the 1 Engineer Support Unit(Regular force). The garrison also houses the 37 Canadian Brigade Group Headquarters (reserve force) and one of the 37 Brigades constituent units; the 8th Canadian Hussars (Princess Louise's), which is an armoured reconnaissance regiment. 3 Area support unit Det Moncton, and 42 Canadian Forces Health Services Centre Det Moncton provide logistical support for the base. In 2013, the last regular forces units left the Moncton base, but the reserve units remain active and Moncton remains the 37 Canadian Brigade Unit headquarters. The Moncton Hospital is one of two major teaching hospitals located in Moncton. There are two major regional referral and teaching hospitals in Moncton. The Moncton Hospital has approximately 381 inpatient beds and is affiliated with Dalhousie University Medical School. It is home to the Northumberland family medicine residency training program and is a site for third and fourth year clinical training for medical students in the Dalhousie Medicine New Brunswick Training Program. The hospital hosts UNB degree programs in nursing and medical x-ray technology and professional internships in fields such as dietetics. Specialized medical services at the hospital include neurosurgery, peripheral and neuro-interventional radiology, vascular surgery, thoracic surgery, hepatobiliary surgery, orthopedics, trauma, burn unit, medical oncology, neonatal intensive care, and adolescent psychiatry. A $48 million expansion to the hospital was completed in 2009 and contains a new laboratory, ambulatory care centre, and provincial level one trauma centre. A new oncology clinic was built at the hospital and opened in late 2014. The Moncton Hospital is managed by Horizon Health Network (formerly the South East Regional Health Authority). The Dr. Georges-L.-Dumont University Hospital Centre was established in 1922. The Dr. Georges-L.-Dumont University Hospital Centre has about 302 beds  and hosts a medical training program through the local CFMNB and distant Université de Sherbrooke Medical School. There are also degree programs in nursing, medical x-ray technology, medical laboratory technology and inhalotherapy which are administered by Université de Moncton. Specialized medical services include medical oncology, radiation oncology, orthopedics, vascular surgery, and nephrology. A cardiac cath lab is being studied for the hospital and a new PET/CT scanner has been installed. A $75 million expansion for ambulatory care, expanded surgery suites, and medical training is currently under construction. The hospital is also the location of the Atlantic Cancer Research Institute. This hospital is managed by francophone Vitalité Health Network. The internal working languages of the hospitals are English for the Moncton Hospital (Horizon Health Network) and French for the Dumont Hospital (Vitalité). However both health networks and their hospitals are required to provide services to the public in both official languages, in accordance with the New Brunswick Official Languages Act. Greater Moncton Roméo LeBlanc International Airport serves as the international airport for the entire Greater Moncton metropolitan area. Moncton is served by the Greater Moncton Roméo LeBlanc International Airport (YQM). The airport was renamed for former Canadian Governor-General (and native son) Roméo LeBlanc in 2016. A new airport terminal with an international arrivals area was opened in 2002 by Her Majesty Queen Elizabeth II. The GMIA handles about 677,000 passengers per year, making it the second busiest airport in the Maritime provinces in terms of passenger volume. The GMIA is also the 10th busiest airport in Canada in terms of freight. Regular scheduled destinations include Halifax, Montreal, Ottawa, Toronto and Hamilton. Scheduled service providers include Air Canada, Air Canada Express, Westjet and Porter Airlines. Seasonal direct air service is provided to destinations in Cuba, Mexico, the Dominican Republic, Jamaica, and Florida, with operators including Sunwing Airlines, Air Transat, and Westjet. FedEx, UPS, and Purolator all have their Atlantic Canadian air cargo bases at the facility. The GMIA is the home of the Moncton Flight College; the largest pilot training institution in Canada, and is also the base for the regional RCMP air service, the New Brunswick Air Ambulance Service and the regional Transport Canada hangar and depot. There is a second smaller aerodrome near Elmwood Drive. McEwen Airfield (CCG4) is a private airstrip used for general aviation. Skydive Moncton operates the province's only nationally certified sports parachute club out of this facility. The Moncton Area Control Centre is one of only seven regional air traffic control centres in Canada. This centre monitors over 430,000 flights a year, 80% of which are either entering or leaving North American airspace. Moncton lies on Route 2 of the Trans-Canada Highway, which leads to Nova Scotia in the east and to Fredericton and Quebec in the west. Route 15 intersects Route 2 at the eastern outskirts of Moncton, heads northeast leading to Shediac and northern New Brunswick, Route 16 connects to route 15 at Shediac and leads to Port Elgin and Prince Edward Island. Route 1 intersects Route 2 approximately 15 kilometres (9 mi) west of the city and leads to Saint John and the U.S. border. Wheeler Boulevard (Route 15) serves as an internal ring road, extending from the Petitcodiac River Causeway to Dieppe before exiting the city and heading for Shediac. Inside the city it is an expressway bounded at either end by traffic circles. 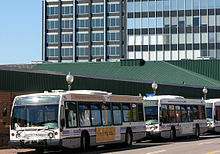 Codiac Transpo is a public transit bus service throughout Greater Moncton. The Metro Moncton Area is served by Codiac Transpo, which is operated by the City of Moncton. It operates 40 buses on 19 routes throughout Moncton, Dieppe, and Riverview. Maritime Bus provides intercity service to the region. Moncton is the largest hub in the system. All other major centres in New Brunswick, as well as Charlottetown, Halifax, and Truro are served out of the Moncton terminal. Freight rail transportation in Moncton is provided by Canadian National Railway. Although the presence of the CNR in Moncton has diminished greatly since the 1970s, the railway still maintains a large classification yard and intermodal facility in the west end of the city, and the regional headquarters for Atlantic Canada is still located here as well. Passenger rail transportation is provided by Via Rail Canada, with their train the Ocean serving the Moncton railway station three days per week to Halifax and to Montreal, Quebec. The downtown Via station has been refurbished and also serves as the terminal for the Maritime Bus intercity bus service. École L'Odyssée is one of six publicly-funded secondary schools in the city. 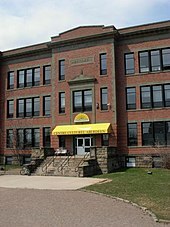 The South School Board administers 10 Francophone schools, including high schools École Mathieu-Martin and École L'Odyssée. The East School Board administers 25 Anglophone schools including Moncton, Harrison Trimble, Bernice MacNaughton, and Riverview high schools. The Université de Moncton is a French-language university, and the only publicly-funded university whose main campus is located in Moncton. The Université de Moncton is a publicly funded provincial comprehensive university and is the largest francophone Canadian university outside of Quebec. Crandall University is a private undergraduate liberal arts university. The University of New Brunswick has a satellite health sciences campus at Moncton Hospital offering degrees in nursing and medical X-ray technology. The Moncton campus of the New Brunswick Community College has 1600 full-time students and also hundreds of part-time students. The Collège communautaire du Nouveau-Brunswick offers training in trades and technologies. Medavie HealthEd, a subsidiary of Medavie Health Services, is a Canadian Medical Association accredited school providing training in Primary and Advanced Care Paramedicine, as well as the Advanced Emergent Care (AEC) program of the Department of National Defence (Canada). Eastern College offers programs are offered in the areas of Business and Administration, Art and Design, Health Care, Social Sciences & Justice, Tourism & Hospitality, and Trades. Moncton Flight College is one of Canada's oldest and largest flight schools. McKenzie College specializes in graphic design, digital media, and animation. The private Oulton College provides training in business, paramedical, dental sciences, pharmacy, veterinary, youth care and paralegal programs. 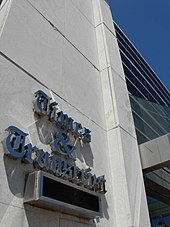 The Times & Transcript building is located in Downtown Moncton. It is the highest daily circulated newspaper in New Brunswick. Moncton's daily newspaper is the Times & Transcript, which has the highest circulation of any daily newspaper in New Brunswick. More than 60 percent of city households subscribe daily, and more than 90 percent of Moncton residents read the Times & Transcript at least once a week. The city's other publications include L'Acadie Nouvelle, a French newspaper published in Caraquet in northern New Brunswick. There are 16 broadcast radio stations in the city covering a variety of genres and interests, all on the FM dial. Ten of these stations are English and six are French. Rogers Cable has its provincial headquarters and main production facilities in Moncton and broadcasts on two community channels, Cable 9 in French and Cable 10 in English. The French-language arm of the CBC, Radio-Canada, maintains its Atlantic Canadian headquarters in Moncton. There are three other broadcast television stations in Moncton and these represent all of the major national networks. Moncton has been the home of a number of notable people, including National Hockey League Hall of Famer and NHL scoring champion Gordie Drillon, World and Olympic champion curler Russ Howard, distinguished literary critic and theorist Northrop Frye, former Governor-General of Canada Roméo LeBlanc, and former Supreme Court Justice Ivan Cleveland Rand, developer of the Rand Formula and Canada's representative on the UNSCOP commission. Trudy Mackay FRS, renowned quantitative geneticist, member of the Royal Society and National Academy of Sciences, and recipient of the prestigious Wolf Prize for agriculture (2016), was born in Moncton. Robb Wells, the actor who plays Ricky on the Showcase hit comedy Trailer Park Boys hails from Moncton, along with Chris Lee, Jacques Daigle, Julie Doiron, an indie rock musician, and Holly Dignard the actress who plays Nicole Miller on the CTV series Whistler. Harry Currie, noted Canadian conductor, musician, educator, journalist and author was born in Moncton and graduated from MHS. Antonine Maillet, a francophone author, recipient of the Order of Canada and the "Prix Goncourt", the highest honour in francophone literature, is also from Moncton. France Daigle, another acclaimed Acadian novelist and playwright, was born and resides in Moncton, and is noted for her pioneering use of chiac in Acadian literature, was the recipient of the 2012 Governor General's Literary Prize in French Fiction, for her novel Pour Sûr (translated into English as "For Sure"). Canadian hockey star Sidney Crosby graduated from Harrison Trimble High School in Moncton. ^ Cathy LeBreton (22 October 2012). "Major employment forum held this week in Moncton". News 91.9. Rogers Communications. Archived from the original on 8 February 2013. Retrieved 5 November 2012. ^ "Population and dwelling counts, for Canada, provinces and territories, and census subdivisions (municipalities), 2006 and 2001 censuses - 100% data". Statistics Canada, 2006 Census of Population. 13 March 2007. Retrieved 26 June 2007. ^ "Population and dwelling counts, for urban areas, 2006 and 2001 censuses - 100% data". Statistics Canada, 2006 Census of Population. 13 March 2007. Retrieved 26 June 2007. ^ a b "Population and dwelling counts, for census metropolitan areas and census agglomerations, 2006 and 2001 censuses - 100% data". Statistics Canada, 2006 Census of Population. 13 March 2007. Retrieved 26 June 2007. ^ "Weatherbase: Historical Weather for Moncton, New Brunswick, Canada". Weatherbase. Retrieved 26 June 2007. ^ "Geographical hierarchy". Statistics Canada. 19 January 2009. Archived from the original on 19 February 2012. Retrieved 24 January 2009. ^ a b c d e f g h i j Medjuck, Sheva (13 March 2007). "Moncton". The Canadian Encyclopedia. Retrieved 4 July 2007. ^ "Parks Canada - Fort Beauséjour – Fort Cumberland National Historic Site of Canada - Natural Wonders & Cultural Treasures - Cultural Heritage". Parks Canada. Archived from the original on 8 February 2007. Retrieved 9 July 2007. ^ "Acadia, History of". Canadian Encyclopedia. 13 March 2007. Retrieved 19 July 2007. ^ "The History of Moncton". Tourism Moncton. 2008. Retrieved 19 October 2008. ^ Brown, George W. (1966). Dictionary of Canadian Biography. University of Toronto Press. p. 727. ISBN 0-8020-3142-0. ^ a b "National Transcontinental Railway". The Canadian Encyclopedia. 13 March 2007. Retrieved 19 July 2007. ^ "Company Histories: Eaton's". Virtual Museum of Canada. Archived from the original on 25 January 2008. Retrieved 24 January 2009. ^ "Musée acadien de l'Université de Moncton - Canada -". virtualmuseum.ca. Archived from the original on 2 July 2007. Retrieved 9 July 2007. ^ "University of Moncton". Government of New Brunswick. 13 March 2006. Archived from the original on 16 November 2007. Retrieved 16 February 2008. ^ "Moncton". The Columbia Encyclopedia, Sixth Edition. 13 March 2001. Archived from the original on 8 December 2007. Retrieved 19 July 2007. ^ "CFB Gagetown Support Detachment Moncton". Department of National Defence. 12 September 2006. Archived from the original on 17 March 2004. Retrieved 15 July 2007. ^ Wickens, Barbara (27 October 1997). "When cheaper is better". Maclean's. 110 (43). p. 10. ^ "Turner and Drake newsletter: Spring 1994". Turner Drake & Partners Ltd. Retrieved 19 July 2007. ^ "Organization internationale de la Francophonie: Choronologie" (PDF) (in French). Francophonie. p. 2. Archived from the original (PDF) on 7 March 2008. Retrieved 24 January 2009. ^ "GMIA Home". Greater Moncton International Airport. Archived from the original on 7 November 2004. Retrieved 15 July 2007. ^ "Gunningsville Bridge opens to traffic (05/11/19)". Communications New Brunswick. 19 November 2005. Retrieved 15 July 2007. ^ a b "Moncton votes to become Canada's first bilingual city". CBC News. 7 August 2002. Archived from the original on 16 October 2006. Retrieved 25 June 2007. ^ "2006 Community Profiles". Statistics Canada. 2006. Retrieved 20 July 2007. ^ a b "After 42 Years, a River Finally Runs Through it". 2010. Retrieved 15 March 2010. ^ a b "Legion Magazine : The Tidal Bore". Legion Magazine. 2000. Retrieved 26 June 2007. ^ "Info on the Tidal bore in Moncton". Legion Magazine. 13 March 2007. Retrieved 26 June 2007. ^ "Tidal Bore Makes Waves". 2010. Archived from the original on 1 May 2010. Retrieved 27 March 2010. ^ a b c "Moncton Climate data". Environment Canada, Climate of New Brunswick Report. 13 March 2007. Archived from the original on 3 June 2007. Retrieved 3 July 2007. ^ "Nor'easters". Wheeling Jesuit University. 13 March 2007. Archived from the original on 26 June 2007. Retrieved 18 July 2007. ^ "Global warming disaster as thousands of harp seal pups perish: Experts call for annual seal hunt to be cancelled". International Fund for Animal Welfare. Archived from the original on 7 February 2008. Retrieved 24 January 2009. ^ a b c d "Canadian Climate Normals 1971–2000, Moncton Airport". Environment Canada. Retrieved 24 March 2012. ^ a b "Monthly Record, Meteorological Observations in Canada". Environment Canada. 1935. Retrieved 15 November 2016. ^ a b "Moncton, NB". Canadian Climate Normals 1981–2010. Environment Canada. Retrieved 19 March 2016. ^ "Daily Data Report for September 2010". Canadian Climate Data. Environment Canada. Retrieved 26 June 2016. ^ "Daily Data report for March 2012". Canadian Climate Data. Environment Canada. Retrieved 26 June 2016. ^ "Moncton A". Canadian Climate Normals 1981–2010. Environment Canada. Retrieved 12 May 2014. ^ "September 2010". Canadian Climate Data. Environment Canada. Retrieved 18 March 2016. ^ "October 2011". Canadian Climate Data. Environment Canada. Retrieved 18 March 2016. ^ "March 2012". Canadian Climate Data. Environment Canada. Retrieved 18 March 2016. ^ "Bell Aliant Tower". Canada's Historic Places. 20 April 2007. Retrieved 25 July 2007. ^ "Assumption Life and the Drop Zone Create Some Extreme Thrills". Assumption Life. 31 August 2006. Retrieved 4 May 2008. ^ "Blue Cross Centre". Fortis Inc. 20 April 2006. Archived from the original on 8 December 2007. Retrieved 25 July 2007. ^ "Centennial Park". www.moncton.ca. 6 April 2008. Archived from the original on 31 March 2016. Retrieved 8 May 2008. ^ "Community Parks". www.moncton.ca. 6 April 2008. Archived from the original on 8 March 2016. Retrieved 8 May 2008. ^ a b c d e "2011 Community Profiles". Statistics Canada. Retrieved 19 May 2014. ^ a b "The Greater Moncton Economy "Towards a Vision"" (PDF). greatermoncton.org. Archived from the original (PDF) on 5 May 2006. Retrieved 18 June 2007. ^ National Household Survey (NHS) Profile, 2011, Statistics Canada, 2012. ^ Moncton group seeks Korean immigrants, CBC.ca, October 11, 2011. ^ "Downtown Moncton at a Glance". DMCI. Archived from the original on 14 April 2010. Retrieved 18 June 2007. ^ "Selected trend data for Moncton (CMA), 2006, 2001 and 1996 censuses". Statistics Canada. June 2008. Retrieved 14 January 2009. ^ Andy Holloway (November 2004). "The best cities for business in Canada". Canadian Business Magazine. Archived from the original on 5 February 2008. Retrieved 25 June 2007. ^ "Moncton ranked among most business-friendly cities, Times and Transcript May 9, 2007". Colliers International. Archived from the original on 27 September 2007. Retrieved 25 June 2007. ^ "Colliers International (Atlantic) Inc. - Moncton". Colliers International. Archived from the original on 27 April 2006. Retrieved 18 June 2007. ^ "nanoptix". nanoptix. Retrieved 18 February 2008. ^ "TrustMe". TrustMe Security. Retrieved 19 February 2008. ^ "TD Bank announces new banking services centre in Moncton". ^ "Irving Group Moncton". J.D. Irving Limited. Archived from the original on 28 September 2007. Retrieved 18 June 2007. ^ a b "Gunningsville Bridge information". Government of New Brunswick. 19 November 2005. Retrieved 15 July 2007. ^ "The operative word for Moncton during 2006 was "up"! Moncton for Business - Moncton en Affaires". Moncton for Business. Archived from the original on 27 September 2007. Retrieved 18 June 2007. ^ "Living in Greater Moncton" (PDF). City of Moncton. 15 July 2003. Archived from the original (PDF) on 9 April 2008. Retrieved 26 June 2007. ^ a b c "Capitol History". Capitol Theater. 13 March 2007. Archived from the original on 16 July 2007. Retrieved 19 July 2007. ^ "Defining 'Culture' in Moncton". Here NB. 29 January 2009. Archived from the original on 8 July 2011. Retrieved 30 January 2009. ^ "About The Aberdeen Cultural Centre (French)". Aberdeen Cultural Centre. Archived from the original on 4 July 2007. Retrieved 20 July 2007. ^ "Resurgo Place". Archived from the original on 6 September 2018. Retrieved 9 December 2018. ^ a b "Moncton Museum". Moncton Museum. 13 April 2008. Archived from the original on 19 July 2011. Retrieved 8 May 2008. ^ Treitz Haus. Canadian Register of Historic Places. Retrieved 2009-01-30. ^ "L'ONF en Acadie, 35 ans de création". National Film Board of Canada (in French). Retrieved 18 April 2017. ^ "Frye Festival History". Frye Festival. 13 March 2006. Archived from the original on 9 July 2007. Retrieved 20 July 2007. ^ "Car star revs up auto show". Times and Transcript. 13 March 2005. Archived from the original on 14 May 2011. Retrieved 18 February 2008. ^ "The Government of Canada Supports HubCap Comedy Festival". Department of Canadian Heritage. 17 July 2008. Archived from the original on 8 June 2011. Retrieved 27 January 2009. ^ a b "Magnetic Hill". Tourism New-Brunswick. Archived from the original on 12 June 2008. Retrieved 18 February 2008. ^ "Magnetic Hill Zoo". New-Brunswick-Net. Retrieved 20 July 2007. ^ "Magic Mountain". Magic Mountain Water Park. Archived from the original on 1 July 2007. Retrieved 20 July 2007. ^ Bogomolny, Laura (26 September 2005). "Saint John VS Moncton". Canadian Business. 78 (19). ^ "They came They saw They Rocked!". Moncton Industrial Development. Archived from the original on 27 September 2007. Retrieved 20 July 2007. ^ Eric Lewis. "Eagles show may have set Cdn. records". Times & Transcript. Archived from the original on 14 May 2011. Retrieved 30 January 2009. ^ "Canadian Super Regional Shopping Centres". Cadillac Fairview. Archived from the original on 28 October 2007. Retrieved 24 January 2009. ^ "Coolest Malls in North America". Canadian Automobile Association. Archived from the original on 6 July 2011. Retrieved 27 January 2008. ^ "Information for Newcomers". Dieppe. Archived from the original on 19 December 2007. Retrieved 27 January 2008. ^ "CEPS - Français". Universite de Moncton. Archived from the original on 27 September 2007. Retrieved 20 July 2007. ^ "Facilities". Atlantic Cycling Centre. Retrieved 24 January 2009. ^ "Royal Oaks Estates & Golf Club - Architect". Royal Oaks Estates & Golf Club. Archived from the original on 28 September 2007. Retrieved 9 July 2007. ^ Harding, Gail. "Dieppe Commandos hockey franchise moving to Edmundston". CBC. Retrieved 17 April 2017. ^ "Moncton wins national senior baseball championship". CBC. 28 August 2006. Archived from the original on 1 September 2006. Retrieved 5 February 2009. ^ "Magic retire Miracles". 22 June 2017. ^ "Aigles Bleus". University of Moncton. 19 September 2008. Archived from the original on 7 November 2008. Retrieved 5 February 2009. ^ "CIS Membership Directory". Canadian Interuniversity Sport. 19 September 2008. Archived from the original on 15 June 2008. Retrieved 5 February 2009. ^ "Fisher Cats Savour City's First Senior Baseball Championship in 12 Years". Moncton Times & Transcript. Retrieved 30 September 2017. ^ "MasterCard Memorial Cup". Canadian Hockey League. Archived from the original on 4 July 2007. Retrieved 25 June 2007. ^ "2007 CIS Men's Hockey Championships". Canadian Interuniversity Sport. Archived from the original on 7 April 2007. Retrieved 25 June 2007. ^ "Moncton awarded 2010 IAAF World Junior Championships" (PDF). City of Moncton. Archived from the original (PDF) on 28 June 2007. Retrieved 25 June 2007. ^ "CANADIAN FOOTBALL LEAGUE | CFL's Touchdown Atlantic". Newswire.ca. 30 July 2010. Archived from the original on 27 July 2011. Retrieved 25 October 2010. ^ "Moncton City Council (2004 - 2008)". City of Moncton. Archived from the original on 12 June 2018. Retrieved 8 August 2008. ^ a b c d "Canadian Military History Page". Bruce Forsyth. 13 March 2007. Archived from the original on 5 February 2007. Retrieved 20 July 2007. ^ a b c d "CFB Gagetown Support Detachment Moncton". Department of National Defence and the Canadian Forces. 13 March 2007. Archived from the original on 17 March 2004. Retrieved 20 July 2007. ^ "CLC Corporate Plan 1999-2004" (PDF). Canada Lands Company. 13 March 2007. Archived from the original (PDF) on 24 July 2007. Retrieved 20 July 2007. ^ "The Moncton Hospital". Horizon Health Network. Retrieved 9 October 2017. ^ "SERHA's Health: Taking a large step into the future" (PDF). SERHA. Archived from the original (PDF) on 30 May 2008. Retrieved 15 July 2007. ^ "Dr. Georges-L-Dumont Hospital Centre". ^ "Georges Dumont Hospital to host new cardiac lab". CBC News. 23 January 2007. Archived from the original on 8 December 2007. Retrieved 9 July 2007. ^ "R&D Facilities". New Brunswick. 23 May 2008. Archived from the original on 22 November 2008. Retrieved 30 January 2009. ^ "Your language rights in New Brunswick. Factsheet 2 - Health Care". officiallanguages.nb.ca. Office of the Commissioner of Official Languages of New Brunswick. March 2017. Retrieved 3 September 2018. ^ "GMIA 2006 Report" (PDF). Greater Moncton International Airport. 13 March 2007. Archived from the original (PDF) on 10 July 2007. Retrieved 9 July 2007. ^ "GMIA Airlines". Greater Moncton International Airport. 13 March 2007. Archived from the original on 27 September 2007. Retrieved 15 July 2007. ^ "Moncton Flight College Receives Civil Aviation Authority of China Approval to Train Chinese Pilots". CANLink Global. 15 May 2006. Archived from the original on 29 December 2017. Retrieved 9 July 2007. ^ "Skydive Moncton". skydivemoncton.com. Retrieved 18 February 2008. ^ a b "Google maps: Moncton". Google Maps. 1 January 2006. Retrieved 15 July 2007. ^ "Codiac Transit Commission". Codiac Transit. Archived from the original on 10 July 2007. Retrieved 15 July 2007. ^ "Via Rail Canada / Halifax-Montreal train (the Ocean)". Via Rail. Retrieved 15 July 2007. ^ "Reseau Sesame Network: City Close-Up". Reseau Sesame Network. 13 March 2005. Archived from the original on 28 September 2007. Retrieved 4 July 2007. ^ "CAE Global Academy: Global strength" (PDF). CAE. Archived from the original (PDF) on 28 February 2008. Retrieved 24 January 2009. ^ "Weekly Readership by Resident Market newspaper readership" (PDF). NADBank. Archived from the original (PDF) on 24 November 2006. Retrieved 9 January 2008. ^ "Gordie Drillon". FantasyPlayers.com. 13 March 2005. Retrieved 25 July 2007. ^ "Our Background". Team Howard. 13 March 2005. Archived from the original on 4 May 2007. Retrieved 2007-07-25. ^ Ayre, John (13 March 2007). "Moncton". The Canadian Encyclopedia. Retrieved 4 July 2007. ^ Ayre, John (13 March 2007). "LeBlanc, Romeo A." The Canadian Encyclopedia. Retrieved 4 July 2007. ^ "Rand, Ivan Cleveland". The Canadian Encyclopedia. 13 March 2007. Retrieved 4 July 2007. ^ "Trudy Mackay". royalsociety.org. Retrieved 16 May 2018. ^ http://www.nasonline.org, National Academy of Sciences -. "Trudy Mackay". www.nasonline.org. Retrieved 16 May 2018. ^ Simply-Smart. "Mackay, Trudy Frances Charlene". www.wolffund.org.il. Retrieved 16 May 2018. ^ "Tar Heel: Trudy Mackay works with fruit flies to solve genetic mysteries". newsobserver. Retrieved 16 May 2018. ^ "Robb Wells". northernstar.ca. 14 April 2007. Archived from the original on 31 August 2009. Retrieved 5 February 2009. ^ "Robb Wells". TV.com. 19 June 2008. Retrieved 5 February 2009. ^ Shannon Webb-Campbell (10 September 2007). "Julie Doiron Doing Three Things At Once This Month". Chart. Archived from the original on 9 January 2009. Retrieved 31 January 2009. ^ "Julie Doiron". Juliedoiron.com. 18 September 2007. Archived from the original on 4 February 2009. Retrieved 31 January 2009. ^ "Holly Dignard - About". HollyDignard.com. 14 March 2008. Retrieved 5 February 2009. ^ Larry Shouldice (1 January 2005). "Antonine Maillet". Dictionary of Literary Biography. Retrieved 31 January 2009. ^ "Lafayette's Sister Cities". Lafayette, Louisiana. 13 March 2007. Archived from the original on 6 January 2010. Retrieved 25 July 2007. ^ "Year in Review 2005" (PDF). City of Moncton. 13 March 2005. Archived from the original (PDF) on 9 August 2007. Retrieved 25 July 2007. ^ "The City of North Bay". Nipissing University. 13 March 2005. Archived from the original on 13 May 2011. Retrieved 16 April 2016. Larracey, Edward (1970). The First Hundred: A Story of the First 100 Years of Moncton's Existence. Moncton Publishing Company. ASIN B0000EEQHJ. Machum, Lloyd A. (1965). A History of Moncton Town and City 1855-1965. Moncton Publishing Company. ASIN B0000EEUF0. Boudreau, Amy (1970). The Story of the Acadians. Pelican Publishing Company. ISBN 0-911116-30-3. Larracey, Edward (1991). Resurgo, The History of Moncton From 1890-1990. City of Moncton. ISBN 0-9694634-2-1. Walls, Martha (2006). New Brunswick Book of Everything. MacIntyre Purcell Publishing Inc. ISBN 0-9738063-2-X. Merlin, Kate (2003). Trails of Greater Moncton. Goose Lane Editions. ISBN 0-86492-349-X. 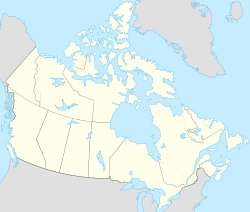 Wikimedia Commons has media related to Moncton. Wikivoyage has a travel guide for Moncton.